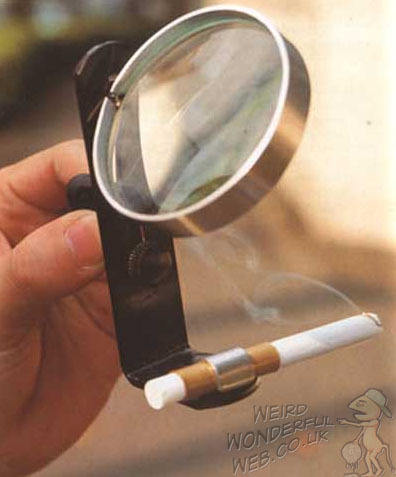 Weird Wonderful Web: Solar powered cigarette lighter! Fed up with having to remember to keep your boxes of matches out of the reach of your children? Or having said matches snap while striking them against the crappy box for the eleventh time? Worried about keeping vast quantities of dangerous lighter fuel sitting around your home? Lost count of how many disposable lighters with just a few drips of fuel left in them there are scattered around your house, car and in several pockets? Solar power is the future they say. Although this contraption doesn't look very futuristic I grant you. "It's only when you look at an ant through a magnifying glass on a sunny day that you realise how often they burst into flames"
I think that this is more a funny way to ignite your cigarettes rather than attractive.The mirror reflects raises provides energy and this heat energy will in turn helps in burning.